I have to be honest that until now I had no idea what Zeuhl is, (I was attracted by the high rating in the TOP 2010 which aroused my curiosity), the problem is that after listening to this album I don't regret my ignorance.. I write this review for people who are not from planet Kobaia or who like me haven't heard until now about Zeuhl. In order to make clear where my tastes tastes stand on the progressive map, let me tell you that my tastes go from Renaissance to Yes,I listen(but it's hard to me to say 'I enjoy') to KC, I also love classical music and Jazz(from Louis Armstrong to John Zorn). 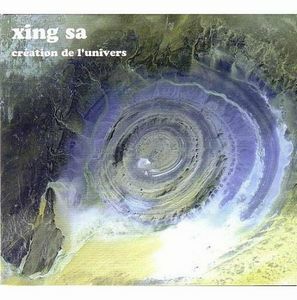 Xing Sa have gone a long way from the traditional french music most of us know, and it's not a wrong way but it's a hard way. Creation de l'Universe is a rather difficult piece of music, I disliked it at first listening, and started to accept it at 3rd listening, I can't say I like it. I am not sure how well it describes the universe creation because I wasn't there. According to Xing Sa it was mostly instrumental, with a lot of keyboards, a lot of fusion but also with many boring moments. Overall, not a bad album, interesting , but one that it's difficult to fall in love with.